The basis of my successful pigeon sport of nowadays is based, besides full attention for the keeping, health and selection, especially on building up an own strain. I started with that idea very serious about 30 years ago. 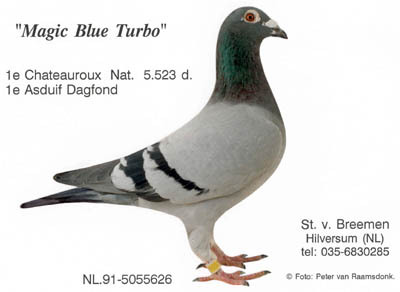 My first pigeons of the De Smet-Matthijs (Nokere, Belgium) strain, which showed their value with fabulous race results, are nowadays in direct line present in the breeding and in the racing lofts. That is shown by the severe inbred methods very clearly. How that exactly was done, I have written down in my book "The Art of Breeding". Generation after generation I used inbred methods and in the end I bred the birds as I had them in mind in the beginning. 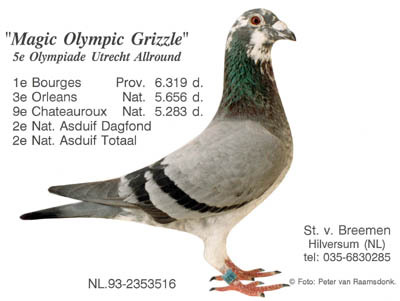 Pigeons who bred after a severe selection on high results National Ace pigeons and breeders in which the breeding value was present in a very high percentage. It was soon very clear to me that importing new bloodlines into the heavily inbred strain was necessairy but very dangerous too. Necessary because the pigeon meets degeneration after having been severely inbred for years. I think it is hardly impossible to maintain the racing ability of a strain without bringing in new fresh blood from another loft c.q. strain. However this is not without any danger. When you do not succeed getting success bringing in new blood into the own strain, you will meet a set-back for several years. 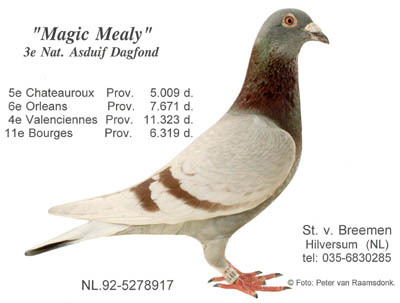 Especially in the inbred method, the crossbreeding and the selection I had the most pleasant days of my pigeon sport. When I describe the pedigree's of my pigeons it will be very clear to you which pigeons I imported, that brought me success and what pigeons even brought me a fortune. Let me say that I'm most grateful for pigeons from the Janssen Brothers, by way of the loft of the late Mr. Jan van Erp from Hilversum, Holland. And for the Valere De Smet-Matthijs pigeons I became from Georges and his son Andre Veys of Elsegem, Belgium. So far the short introduction of my pigeons and the breeding methods in short of what I believe were the start of my success, which is mainly based on own experience. It's developing played an important part in my life and lead to unbelieveable results and worldwide accepted breeding methods. I wanted to create an own strain of racing pigeons with the will to win and that carried at the same time high breeding qualities in them and possessed the capacity to pass those qualities on easily to the next generations. Make your choice from the submenu on the right to read all articles.